Heart disease is one of the commonest abnormalities of the fetus and infant. Malformation of the heart is the commonest congenital malformation and accounts for significant morbidity and mortality in utero and postnatally. 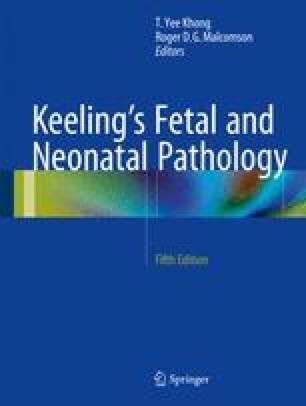 This chapter gives a brief overview of cardiac development and extensive discussion of the methods of pathological examination of the heart including histological sampling. Congenital heart disease has a reputation as a particularly difficult area of pathology. With care and following a few simple rules, all but the most complex cases can be confidently tackled. All the commoner forms are described and illustrated together with an account of heart disease in the fetus. The cardiomyopathies are covered in detail, especially mitochondrial and metabolic cardiomyopathy. Myocarditis, ischemia and infarction, tumors, and abnormalities of cardiac rhythm are all discussed in detail. Already many gene mutations have been identified for cardiomyopathy and channelopathies in particular and the commoner defects are listed.